The Kingdom of Saudi Arabia ‘Vision 2030’ has become a credo as well as a driving force not only in the country but in the immediate region as well.. It is the most ambitious and the most elaborate plan yet in the Kingdom’s history to actively diversify the historically oil-dependent economy. The wheels have been set in motion, and the dollar value of the projects which have been announced or inaugurated is already in hundreds of billions. Complimenting them are the regulatory reforms and market-driven approach underpinning these reforms, creating real momentum and positive outlook for the future. As mega-projects begin to take shape in the sprawling Kingdom, the ability of the logistics sector to respond to the market effectively and efficiently, and to support these projects through constant innovation and improvisation has come into sharp focus. This is a scenario tailormade for LogiPoint; indeed, with the benefit of hindsight, it appears that LogiPoint has been tailormade for just such a scenario. LogiPoint is a subsidiary of the Saudi Industrial Services Company – SISCO, a public company listed on Saudi stock exchange,. LogiPoint have been pioneering innovative logistics solutions in the Kingdom for almost 20 years and have grown from being the developer and operator of the bonded and re-export zone at Jeddah Islamic Port to an enabler of the logistics industry in the Kingdom of Saudi Arabia through its Integrated Logistics Parks and services. Until 2017, LogiPoint were known and recognized in the market as Tusdeer Bonded and Re-Export Zone, the first and the largest zone of its kind in the Kingdom spread on one million square meter of reclaimed land. Tusdeer specialized in catering to the needs of importers and exporters whose cargo passed through one of the Jeddah Islamic Port terminals or needed to be stored in JIP until commercial or clearance formalities could be completed. The rebranding as LogiPoint became necessary when company set itselffor expansion in order to serve and be an enabler to Vision 2030 by offering state of the art facilities at fully integrated Logistics Parks in different locations across Kingdom and provide highly specialized operational support to its diverse base of local and international clients. Mr. Shaikh was referring to the wide array of logistics solutions which LogiPoint offers to an ever-expanding base of global and regional clients. Today, the LogiPoint Bonded and Re-Export Zone is a world-class, customer-centric, integrated logistics services area, where international and local clients are able to take advantage of auxiliary port services, lead-logistics, specialized handling and storage, labeling, co-packaging, and even turn-key supply chain integration from the port terminal to the distribution center. 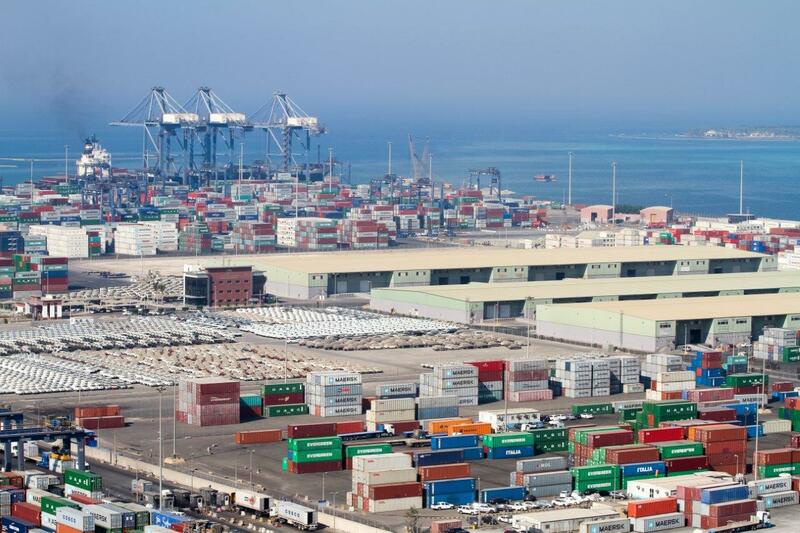 Jeddah port helps clients save 4-8 days in import or export transit time when compared with other ports in the region. This is an advantage which is reinforced through using the LogiPoint services. Farooq Shaikh stresses the advantage LogiPoint brings to clients, “They have the option to import the goods into the Kingdom after breezing through the customs, or to rework and re-export their goods to any part of the world from Jeddah without having to pay customs and duties. There is a dedicated customs office within the Bonded and Re-Export zone to cater to the needs of the clients and to ensure a smooth and speedy clearance process for the shipments.” The value of speedy and smooth clearance in an industry that came up with the term “Just in time” can hardly be over-emphasized. Building on over 20 years of experience of working with regulatory authorities, clients, partners, and other stakeholders, LogiPoint has introduced a simplified export process which allows major exporters in the oil and gas sector to eliminate the need for an intermediary overseas hub for the storage and onward shipping of their cargoes. “We help them reduce their ocean freight costs by shipping their cargo directly to their target markets. The new process has reduced the export processing time from one week to one day – the faster availability of Saudi products in the international markets has led to an increase in demand for them. Direct destination booking also improves the accuracy of Customs export data, and gives us a better understanding of the markets where there is a need and demand for Saudi products”. The need for an integrated logistics infrastructure in the Saudi landscape has long been acknowledged, and LogiPoint have played an extensive role in making such an infrastructure a reality in the Kingdom. Along with their group companies, Red Sea Gateway Terminal (RSGT) – a state of the terminal in JIP, and Support Services Company (ISNAD), LogiPoint have designed seamless integrated logistics solutions for their clients. “This is not only to help in cost reduction through faster, seamless operation; but also to help streamline communication and to provide more transparency across the entire process. Ultimately, this enhances customer experience, leads to increased customer satisfaction and builds confidence amongst all the stakeholders. They can plan their supply chain with greater accuracy and avoid unnecessary costs. It is plain to see that LogiPoint have had incredible success in building innovative and collaborative integrated logistics solutions for the Jeddah Islamic Port clients. They have now embarked on replicating that model beyond the bonded zone and are investing heavily in developing logistics parks and zones in the Kingdom. Two of these projects, ‘Logistics Parks – Modon 1’ and ‘Logistics Parks – South Jeddah’ have already taken shape and are in various stages of completion. ‘Logistics Parks - Modon 1’ is located in the heart of the Jeddah Industrial Area and is spread over 120,000 m2. The proximity to the Jeddah Islamic Port will lead to time and money savings in transport while bringing flexibility and agility to planning and operations for businesses. Additionally, the project offers ample open storage space for cargo, while also providing parking space for vehicles so parking in the industrial area’s congested streets can be avoided. “We will provide additional services aligned with international standards to both existing and new clients, and will look to help bring in new efficiencies in the collective supply chain of the Jeddah region,” said Farooq Shaikh. He explained that through this project heavy traffic flow will also be efficiently managed in and out of the Industrial City. ‘Logistics Parks - South Jeddah’ is located in Al-Khumra, the 2nd largest logistics hub in the Kingdom, and is spread across Jeddah. It is just 20 minutes’ drive from the port, and lies close to two major highways. It is also less than two kilometers from the proposed Land-bridge station which will ultimately represent the western terminal for the trans-Saudi railway linking Jeddah and Dammam via Riyadh. LogiPoint aims to facilitate trade and commerce through creating opportunities, synergies and collaborations in the field of logistics. They remain committed to supporting initiatives which will help lubricate the engines of economic growth. This has been acknowledged by leading independent organizations like Seatrade Maritime and Transport & Logistics Middle East.